2nd Annual SNOWBALL DROP will be new and improved for Light Up 2018. “Gumballs and Snowballs” of savings will float down from the sky to waiting shoppers at 3:00 pm at the Light Up event on November 17th, 2018. Both drops will be free for the community to participate! The 2018 Snowball Drop will start off with a GUMBALL DROP for Children only and a second drop SNOWBALL DROP for Adults only! Limit one ball per person (will not change this year). The CHILDREN’S only “Gumball Drop” will be FIRST and will very similar to last years Snowball Drop for Adults! Children may redeem their gumballs for prizes and discounts at participating businesses and restaurants with corresponding numbers throughout the Columbia Valley. After the children’s only Gumball drop, ADULTS are invited to gather at Cenotaph Park to catch snowballs (ping pong balls) as they fall from the sky. Hundreds of ping-pong balls will be dropped from above! Each snowball will represent a specific discount, gift or prize from local businesses. Customers may redeem their snowballs for prizes and discounts at participating businesses and restaurants with corresponding numbers throughout the Columbia Valley. It is through the generous donations of our local businesses that we can continue this event this year and have it grow! I am thrilled to see the return of many of our wonderful businesses this year and ask other businesses that you please consider joining them as supporters of the 2018 Snowball Drop and new this year, the Gumball Drop. 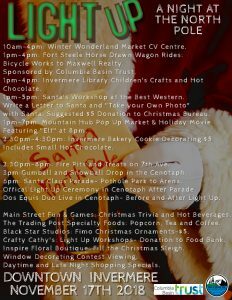 Businesses: Please contact the District of Invermere events Coordinator Cortney Pitts to get your business involved!